it's reggie's 1978 o-pee-chee vs. todd hundley's 2001 topps. reggie, if he made contact, is likely watching the ball sail into the right field bleachers. hundley, on the other hand, is watching the ball he hit travel 50 feet to be caught by the third baseman in front of the pitcher's mound. i guess swinging so hard that you kneel doesn't work for everyone. 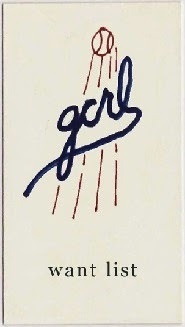 inspired by night owl's recent post, i offer up a few of my favorite - or at least interesting - hair cards. first, it's john henry johnson's 1984 fleer card. nice hair. 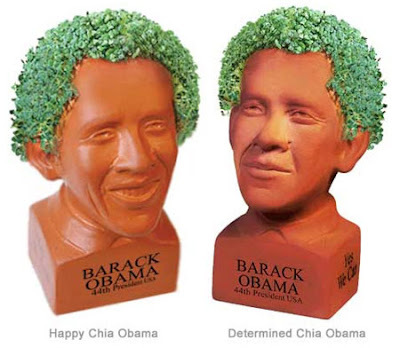 looks like a chia pet. cool that someone's in the dugout using a bat as a lap guitar, but the most perplexing part about this card is the fan just off of j.h.j. 's left shoulder. is it pat? whoever it is, it's sporting the same hairdo as j.h.j. which is fantastic, by the way. next, it's ivan calderon's 1992 upper deck card. 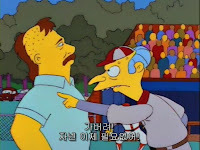 clearly mr. calderon is a fan of the simpsons, and was trying to get into george steinbrenner's favor by going for the don mattingly 'no sideburns' look. similar to the j.h.j., here's ross grimsley on his 1978 topps card. the 1978 set is rife with fantastic hair. just take a look at the next card. it's a rookie outfielders card apparently, rick bosetti didn't get the 'mustache and muttonchop' memo. andy laroche through the mail success! well, i suppose this is appropriate. andy laroche single handedly man handled the dodgers yesterday, going 5 for 5 with 2 doubles, 2 home runs, 6 rbi and 4 runs scored, to postpone (i hope) the dodgers' clinching of the national league west. earlier this summer, he returned to me my 2007 upper deck masterpieces. it took him just under a month to sign and return. now, i wasn't too upset that ned traded laroche, especially after what he got in return performed so well and then re-signed with the dodgers, but i do know that we need a long-term solution at third base. who knows - if laroche pans out, maybe ned can swindle him back from the pirates. thanks to ebay, sportlots, a fellow blogger, the local card shop, and even beckett's marketplace, my magnificent 7 (which had swelled to a nefarious 9) has been dramatically reduced in size. gone are #1 (2003 topps tribute perennial all-star #10 roberto clemente) thanks to the local card shop, #2 (1976 topps #5 tom seaver record breaker) thanks to sportlots, #5 (1974 opc #575 steve garvey) thanks to ebay, and #7 (1997 dodgers mother's bill russell) thanks to the beckett marketplace. #4 (1975 topps #473 ken mcmullen) is being held for me by captain canuck, so i hope to officially remove it from the list very soon. i guess it's time to add some new cards to the list. 1 (up from 3 last time) - 2003 upper deck vintage #81 kazuhisa ishii - a short print in this awesome 1965 topps knock-off set. 2 (up from 6) - 2008 topps heritage high numbers #696 mark sweeney - a late season issue, and a short print at that. 3 (up from 8) - 1976 sspc #594 checklist 6 (ralph branca, carl erskine, pee wee reese). some nice oldtimers from a non-descript set. 4 (up from 9) - 1977 topps cloth sticker checklist (national league all-stars, middle card, middle row). 5 - 1982 donruss ron cey. 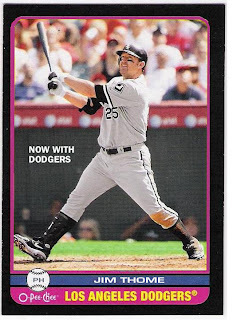 not sure how or why, but i am missing this guy from my dodgers team set. 6 - 1972 o-pee-chee gil hodges. 7 - 2004 fleer greats of the game steve garvey/vin scully. i have one in my garvey collection, but would love to try to get a dual ttm thing going. 7a (down from 4) - 1975 topps #473 ken mcmullen. soon to be deleted from this list. so, there you have it. any help would be appreciated. vin scully through the mail success! or, the greatest mail day joy ever. when i was in jr high, maybe high school, the greatest mail day occurred in february. that's when the sports illustrated swimsuit issue would arrive. yesterday, that was topped. in all, i received 5 different fulfilled ttm requests which is, in and of itself, amazing. but this card is the only one i really noticed. it's a custom 1978 topps vin scully i made a while back, signed in beautiful blue sharpie. 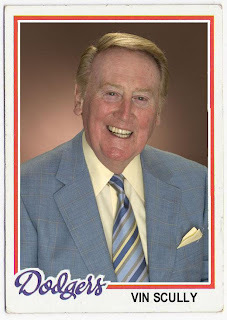 topps has made cards of ernie harwell and bob shepard, but not of vin scully. fleer included him on a greats of the game insert (along with steve garvey) a few years back, but that's been about it. i am not even aware of any regional or sga issues that include him. the only thing close i can think of are the union oil portrait gas station giveaways, and those were 8x10 or so. at any rate, mr. scully took just shy of 3 months to sign and return the card (the dodgers website estimates at least 3 months, so i was not surprised). i did include his $10 fee - happily, i might add. since it's a 1978 topps, i went ahead and created a back, too. if you're wondering, card 727 is al downing, and 728 is boog powell. as a dodger fan, you can imagine how i feel about mr. scully. you can read about it here, actually. and while bobby cox is getting all the press about his retirement that may or may not occur a year from now, mr. scully has quietly announced that he, too, may retire then. we'll have to wait and see. 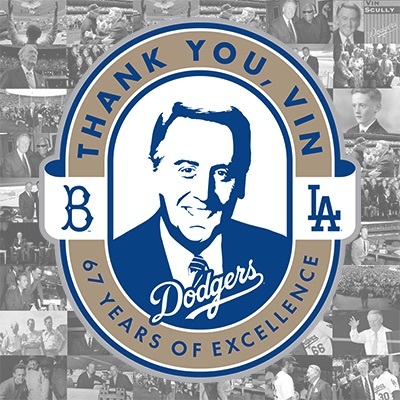 thank you mr. scully, and a very pleasant good evening to you, wherever you may be! skoormit over at exmt sent me some opc for my set ambition. let's take a look. i chose all of the non-studio cards he sent. here's the best of the bunch, in my opinion - chone figgins. nice that they left the umpire in the shot. i must admit - the new(er) angels stadium is a lot better than it used to be when they shared the facility with the rams. maybe the metrodome will improve once the vikings don't have to share it with the twins. maybe. brian schneider. at least it's not a studio shot, i guess. a-rod and jeter - caught in a 'moment' to me, it looks like jeter is explaining that minka kelly > manly looking bleach blonds. that would explain a-rod's conversion to kate hudson types. livan hernandez. can't believe he still has a job. he's not left-handed for crying out loud. pedro feliz. so boring, it might as well be a studio shot. so, let's end with one. mark derosa. thanks skoormit! hope you enjoyed the stuff i sent back your way. a couple months ago, i wrote about the fact that larry hisle, though featured as a dodger on his 1972 topps card, was in fact, never a dodger. well, here's another one. lance parrish. parrish was included in the 1993 lapd dodgers stadium giveaway set. best known as a member of the detroit tigers in the late 70s and early 80s, parrish was signed by the dodgers as a free agent prior to the 1993 season. he had previously spent time in philadelphia, anaheim, and seattle after leaving the tigers, and had been fairly productive. 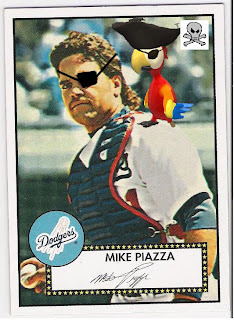 the dodgers, meanwhile, had lost mike scioscia to free agency, and were going into the season with 23 year old mike piazza and 26 year old carlos hernandez behind the plate. with the veteran parrish waiting in the minor leagues, piazza started the season with an 11 game hitting streak and was well on his way to winning the rookie of the year award. suddenly, parrish was expendable, and he was released by the dodgers on may 7. he would play in just 10 games for the indians after signing with the tribe that same day. parrish then went to pittsburgh for the 94 season and finished his career in toronto in 95, after being signed by the royals prior to the season. a classic case of the veteran catcher becoming a vagabond at the end of his career. too bad the dodgers don't officially show up on his resume. cecil cooper through the mail success! it took only about 3 weeks for cecil cooper to sign and return these two cards. i mentioned a few posts ago that i have been branching out my ttm activities to include others from the 1978 topps set - usually either guys who also have dodger cards from other years, or cards from the set that i really like. cooper falls into the latter category. his 1978 card is kind of similar to the toby harrah/bob watson look where topps couldn't quite fit all of him in the picture. i also love the mustard sanitaries. his 1984 donruss also features the baby blues. nuff said. it seems appropriate to post these now, as cooper was dismissed yesterday by the astros. he was nice enough to sign and personalize these cards, offering me 'best wishes'. now, i do the same. best wishes, cecil. and thanks. pinch hitting...for pedro borbon...manny mota. while mota never pinch hit for pedro borbon, he did pinch hit for a lot of people. and, he did so quite successfully, with 150 pinch hits in his career which was a record at the time. sadly, there is no final tribute for manny who played in his last game in 1982. that is, until now. here is the card that should have been: a 1983 o-pee-chee manny mota. manny had retired following the 1979 season and immediately became the dodgers' hitting coach. he came out of retirement to make 7 pinch hit appearances (going 3 for 7 with 2 rbi) in the last month of the 1980 season before retiring again. two years later, the dodgers once again called upon mota to suit up. he made his only 1982 appearance, and the last of his career, on september 1, 1982.
the dodgers were playing against the cardinals at dodger stadium. they trailed the braves by just one-half game in the nl west going into the day, and were fighting to keep pace. with the game going into extra innings, tom lasorda was pulling out all the stops. he had used 7 pinch hitters and one pinch runner going into the bottom of the 13th. the dodgers were trailing 6-5 (ozzie smith had singled in a run in the top of the 13th), and after a ron cey single and caught stealing, followed by a steve garvey double, the rookie mike scioscia was due up. whitey herzog elected to make a pitching change, and brought in jim kaat, the crafty veteran lefty. it should be noted that the cardinals, who were in first place in the east, had already used 6 pitchers, including bruce sutter. lasorda countered with manny mota, who had signed a contract that same day, setting the stage for the 43 year old pitcher to face the 44 year old batter. it was a battle for the ages (ha)! sadly for dodger fans, mota did not hit safely. he grounded out to second, but at least he got the runner over, dadgum it! that's how they did it in his day. the 9th and final pinch hitter of the day, dave sax, lined out to third to strand garvey and end the game. the dodgers would go on to overtake the braves for a short time, but would eventually finish second thanks to joe morgan's (boo!) 3-run home run on the final day of the season. mota retired permanently after the season ended. he has remained with the dodgers organization since his retirement, and is deeply involved in many charity and relief organizations in latin america. i hope to get to spring training next year so i can wave to manny as he rides along on his bicycle. here's to you manny mota! here's my contribution to the cause. with the arrival of jim thome in los angeles as the designated pinch hitter, it brings to mind the question of position on his 2010 cards. since 1974, 'dh' has been an acceptable position for players, including thome as seen on this 2009 upper deck o-pee-chee card. 'ph' is a bit different. 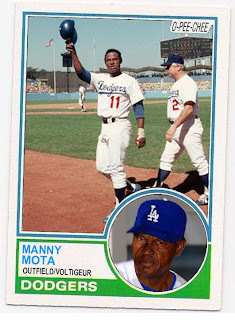 even manny mota, one of the best pinch hitters ever, was listed as an outfielder (and coach) on his last card, a 1981 donruss. this despite the fact that all 7 of his appearances in 1980 were as a pinch hitter. using the pinch hitter position is not unprecendented, though. take a look at lloyd mcclendon's 1992 donruss card. in 1991, mcclendon had 183 at bats including 33 as a pinch hitter, yet donruss deemed it more fitting to list him as a pinch hitter. fair enough. and then there is perhaps the most famous pinch hitter in dodgers history: kirk gibson, who was given the title of an all star ph on this 1989 topps card. so, it would seem that we might expect to see 'ph' on thome's cards next year. heck, we could see it this year with the topps traded release. wouldn't it be nice if upper deck would update their o-pee-chee issue with this card? awesome. and even though he's only 1 for 6 so far with the dodgers as the designated pinch hitter, gibson showed that it only takes one to make it count. twins autograph party fail redeemed with a dave goltz through the mail success! so what if it took just shy of three months for dave goltz to sign and return the cards i sent to him. he still signed 'em, right? way back in june i posted about the twins autograph party and how stoked i was to see an unannounced dave goltz sitting at the table with rod carew and then how disappointed i was when i got to the table and goltz had pulled a keyser soze. today in my mailbox, in a sase cancelled through fargo were my blurry 1982 fleer and a nice looking 1978 topps. i have been targeting dodgers who also had a 1978 topps card for ttm lately, and this fits right in. 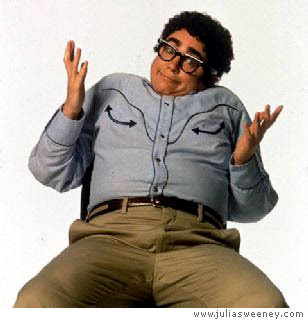 i smell a monster post coming up soon, but for now, i'll let goltz have the floor to himself. a while back i advertised some yankees cards that i wanted to trade for dodgers. bo at baseball cards come to life answered the call and sent a truly fantastic package of dodgers, double plays and cards featuring dodger stadium. it was the cards featuring dodger stadium that caught my attention, because there are some real beauties in there. let's look at some. we'll start with 1993 upper deck eric davis. this is one of my favorite cards - period. davis in the home whites, chasing a flyball down the right field line towards the low fence and the mustard field level seats. this is the same area where milton bradley famously spiked a water bottle a few years back. i used to sit in these seats (although usually on the left field side) and peek into the bullpen while pitchers warmed up. eric davis may have struggled to live up to the expectations coming home to la, but on this card, he's perfect. 1991 fleer damon berryhill. this card is interesting, not only because it features a play at the plate at dodger stadium, but because berryhill did not appear in a game at dodger stadium in 1990. i believe that this photo is from the game on may 7, 1989 - orel hershiser vs. greg maddux - and that's mike davis about to be tagged out at the plate in the third inning. the dodgers would knock maddux out of the game in the 4th, but lose 4-2 anyway. i don't think i was at this game - i am pretty sure i was recovering from seeing the replacements for the first time the night before or heading up to poly royal. 1993 topps stadium club john kruk. i am really hoping brett butler beat the throw. kruk played in six games against the dodgers at dodger stadium in 1992. the first (and only one i checked at baseballreference) was april 29th. in that game, butler did beat out a bunt to second, so let's go with that. 1993 fleer ultra darren daulton. another phillie in dodger stadium. can't tell who's on deck though. 1993 donruss mark gardner. the field level scoreboard is always a dodger stadium giveaway. gardner was the guy who had a no-hitter after 9 innings in 1991 against the dodgers, but lost the no-no and the game in the 10th. two days later, dennis martinez threw a perfect game against the dodgers. 1993 donruss bret barberie. this card is painful to look at. too hard to tell who the dodger player being hammered in the groin is, but i secretly hope it was eric karros. upon further review, barberie got a putout at home plate in the bottom of the first on july 6, 1992 on a relay that went 2-5. the victim? mike scioscia. 1992 upper deck ted power. there's that scoreboard again. power is a former dodger who was traded for mike ramsey. no, the other one. the one who was voted the most obscure dodger at jon weisman's dodger thoughts. 1991 upper deck ted power. two in a row. here's a good shot looking up at the different levels of dodger stadium. the best part about this card, though, is the ball next to power's head. it looks like he's about to use his laser vision to blast it to pieces. 1991 upper deck stan belinda. another pirate in dodger stadium. here you have the stands transitioning to the left field pavilion with the diamond vision screen and the good ol' unocal logo up top. this card comes with a bonus - check out the back: more dodger stadium goodness! 1990 upper deck jose lind. and another pirate. looks like lind was out at second base. he wasn't caught stealing at dodger stadium in 1989, so maybe it was a force or the front end of a double play. i'll let this one be a mystery. nice dodger stirrup, though. 1991 topps doug drabek all star. might as well stick with the pirates. this is the classic dodger stadium rhp shot with the visitor's bullpen in the background. i love how the bullpens at dodger stadium are set up so the pitchers and coaches can sit in a chair and watch the game. no benches parallel to the field level stands here. no sir. 1990 fleer jeff robinson. one more pirate, and a different shot of the right field side field level scoreboard with its own unocal 76 logo. 1990 fleer dwight gooden. not a pirate! here's the left field side field level scoreboard and its unocal 76 logo. 1987 donruss ken dayley. just as 1981 donruss featured an inordinate number of wrigley field shots, 1987 and 1989 donruss seem to have a lot of dodger stadium shots. here dayley is outshone (?) by the beauty of the outfield pavilion in the background, and he knows it. 1987 donruss benito santiago. a rated rookie padre in dodger stadium. 1987 donruss buddy bell. here's a pretty standard 'right handed batter at bat in dodger stadium' card. 1990 upper deck bryn smith. ditto. i secretly wanted smith to pitch from the dodgers. he had ties to (and now lives in) the central coast where i grew up. one of the greatest beards, too. well groomed - it looked like the beard of the young kris kringle in those rankin & bass christmas specials. 1988 fleer dave meads. now we're down by home plate with the old dugout box seats where mike brito used to stand with his panama hat, cigar (unlit) and radar gun. good times. 1991 upper deck rob dibble. now we're getting into some great finds. bo must have really spent some time looking through the cards because the dodger stadium element is pretty tough to see at first glance. there's just a little bit of the pavilion, the main scoreboard and a light stanchion off to dibble's left. awesome. 1991 upper deck joe oliver. not much going on here, but turn it over and you'll see oliver heading to the mound with the field level scoreboard in the background. fantastic. 1992 upper deck armando reynoso. again, pretty nondescript until you flip it now you see the right field pavilion with joe ferguson lurking in the background! 1991 upper deck hubie brooks. not a dodger stadium shot (holman stadium, i believe). just curious about the person behind hubie. it looks like they're wearing the skirt uniform that the dodger stadium female ushers wore, but in shorts style. i am confused. there were also some double play cards, like this 1993 upper deck mike bordick. it features a nice double play turn with dave winfield sliding in. bonus double play action on the back! and we'll end with a few dodger catchers. 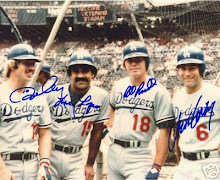 joe ferguson jerry grote johnny oates with steve yeager also in the set, the dodgers may be the only team to garner cards for 4 different catchers in one issue. who knows? bo, thank you for taking the time to put together such a great and enjoyable package. davey lopes through the mail success! pat neshek through the mail success! garland, thome and belliard - oh my! jack morris in person auto success! reggie smith ebay auto success!